Questions about our services? Send email. If you need service for your vehicle and are near the Chagrin River area of Lake County, Ohio, we are the service stop for you. We are small enough to give you personalized service and experienced enough to do the job right. We have the latest tools and equipment to diagnose and repair your vehicle correctly. We are your local alternative to the high prices of new car dealers. You can maintain your vehicle at an affordable price. Since we are a NAPA AutoCare Center, we can offer you The NAPA Parts and Labor Warranty that is honored by NAPA AutoCare centers across the USA. You can travel with confidence. Our service facility is staffed with ASE certified mechanics that will help you maintain your present vehicle, regardless of make or model. We service all cars and light trucks and SUV's. 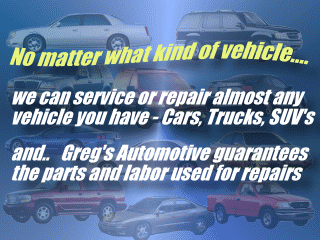 Greg's Automotive is conveniently located on Erie Road in the building complex next to Uncle Bob's Storage. You can get here in just minutes from Eastlake, Willoughby, Mentor and other nearby areas. Warm weather leads to more travel and more work for your vehicle. Brakes, hoses and belts are some of the things that need to be checked before you venture too far from home. Bring your car or truck in now for service before you are left stranded along the highway. ©2010 Copyright Greg's Automotive, all rights, including graphics, are reserved.